Famous landmarks in and around Sorrento include the Piazza Tasso, the Sorrento Cathedral and the Mount Vesuvius volcano. 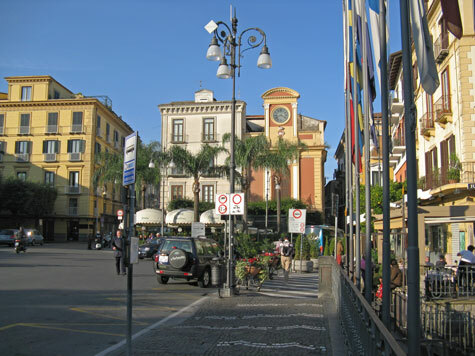 Popular tourist attractions in Sorrento Italy include its parks, gardens and interesting shops. Make sure to explore the back streets! Sorrento is the gateway city for excursions to the Amalfi coast, Capri and Pompeii. Positano and Salerno are also easily accessible. Sorrento Italy is a popular tourist destination and consequently has a wide assortment of hotels and other tourist lodgings. Frequent ferry service operates from Sorrento to Naples, Capri, Positano and other communities on the Gulf of Naples. The Naples Airport is not far away.